-The Sculpture Series- "Wrapped in Red" will be showcased at SMUSH Gallery through May 2018. -May 19, 2018- Ross Daniel and Sarah Rose (DanielRose Projects) will be performing at Dance Fest Milford in Milford Pennsylvania. "Wrapped in Red," a solo performed and created by Ross Daniel Performed at SMUSH Gallery in Jersey City on Saturday April 14, 2018. The showing was apart of SMUSH Moves Vol. 2. This gallery has many upcoming events and opportunities for artists. I will be placing a link below to their website... Stay Connected! Writing my last blog post for my adventures in Paris is bitter sweet. I am going to miss the life of a Parisian but I am excited to be back in America. The past month has been a whirlwind of language barriers, art, food, and most of all… dance. I have learned so much about myself, and the mechanisms I use to cope with new experiences and my practice as a dancer in classes and in artistic endeavors. Even the moments I feel most hopeless I have learned to give myself agency over the situations. In my professional mind, seeing the dance culture in Paris empowered me and sometimes deflated my spirits. “This ‘making art thing’ is going to be hard,” not just in Paris, but all over the world. Paris has taught me the joy of taking classes in a professional setting; to keep you body moving and conditioned to handle the work load of auditioning. It also taught me how few dance jobs there are in the world. I have to want it more than anything and even then it could blow up in my face, all a dancer can do it keep moving and make their opportunities happen! I am learning so much about my body and my abilities, but keeping my skills sharp in determination and positive thought is going to be just as important if not more important than keeping the physical self prepared. I have seen dance shows choreographed by choreographers from around the world, and it has amazed me how they can cultivate art and audiences in the world. It puts my mind on an artistic high for I am now given the task forwarding the dance field with my own variations on ideas that we all share in this world of constant shifts. We live in a world that is quaked and cracked with hate, love, and excitement so it’s only natural to make art that is cultivated in this interesting fertilizer. It is my job to go further to push the “me” more and feel my mind expanding daily with the expansion of our humanity. One thing that I learned with going to the museums of Paris and seeing the dance performances is that “ART IS NEVER GOING OUT OF STYLE.” No matter the funding we the artists will make art happen on which every medium we can, it’s our primal instincts, it’s our purpose. Au Revoir Paris, you have taught me well, but it’s time to take this excitement home! ​Auguste Rodin Museum Assignment: Choose a piece of artwork and write a paragraph of responses. 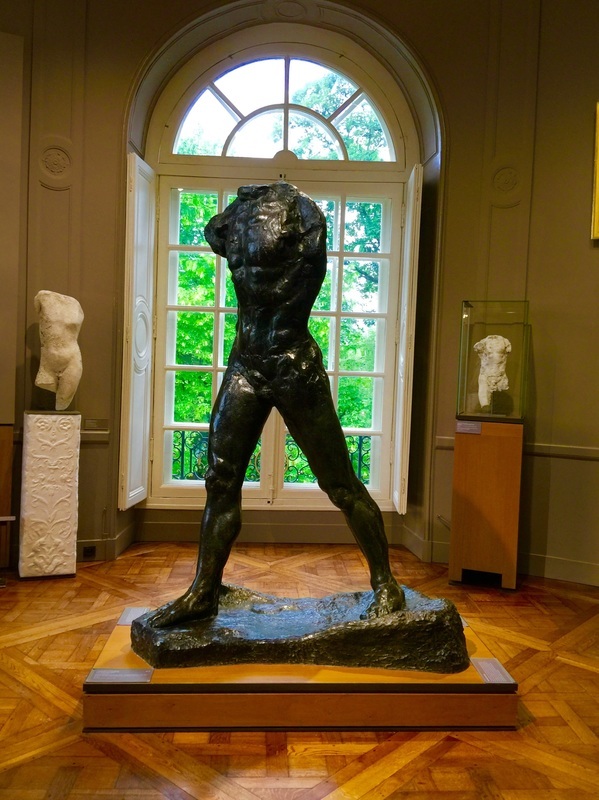 Going to the Rodin museum was an experience that I will never forget, despite the rain and mud this exploration of one of art history’s most celebrated sculptors was inspiring. I walked through the gardens and witnessed the standing masterpieces of the Burghers of Clay, which is a sculpture exhibit that commemorating the Hundred Year War between France and England. As I walked through the house I found one sculpture that stood out to me more that the rest L’Homme Qui Marche (The Walking Man.) Compositionally this sculpture had no humanity due to its lack of face and arms, but the structure of it simple symmetrical A-Frame structure was stunning. The detail in the ridges and folds in the body were remarkable to see in person, which was what Rodin was known for. In the room that it was housed it towered above the rest in a central location, backlit with the greenery of Rodin’s beautiful gardens. I saw many art pieces in this museum that were equally as stunning, but L’Homme Qui Marche was spectacularly simple and exactly what my eyes needed as I work on my upcoming thesis project. One of the events we were able to attend in the past week along with the dress rehearsal of Giselle and Pina Bausch was the documentary Mr. Gaga at its Paris premier. On the topic of the actual documentary I will highly recommend it. It was a wonderfully crafted experience of how Ohad Naharin became the choreographer that he is today, but the big surprise was when he came into the theater after the film was over. When the group left the theatre viewing room and I walked out into the lobby, I went up to the film director and told him how thankful I was that he made this film, and I told him that my connection to Gaga was through Bobbi Jean Smith one of the dancers of Batsheva, who taught 4 classes at FSU this year as a part of a movement study and I was apart of it. He was so excited that he pulled me to meet Ohad Naharin. I was over whelmed and slightly taken off gaud, but when I walked up Ohad shook my hand and then he was ushered away to the next viewing room. It was like meeting a normal man…. But this normal man has changed the field of dance, which is one that I have become so accustomed too within the past 4 years. So many people flocked around him in hopes they could shake his hand or ask him a question or take a picture, it was no doubt that I was in the midst of a star. This entry is simply a super fan blog post, but I couldn’t resist with meeting a man that is doing what I hope to be doing as I work my career further. Ohad Naharin has done so much for dance and contemporary art creation, and I hope to use his knowledge to push my artistry, and push my ideas and push work ethics, so that I can progress this field even further. ​I have gained more from my weekend adventures than just stamps in my passport, but rather an array of information about the culture difference between countries that are a two-hour train ride away from one another. 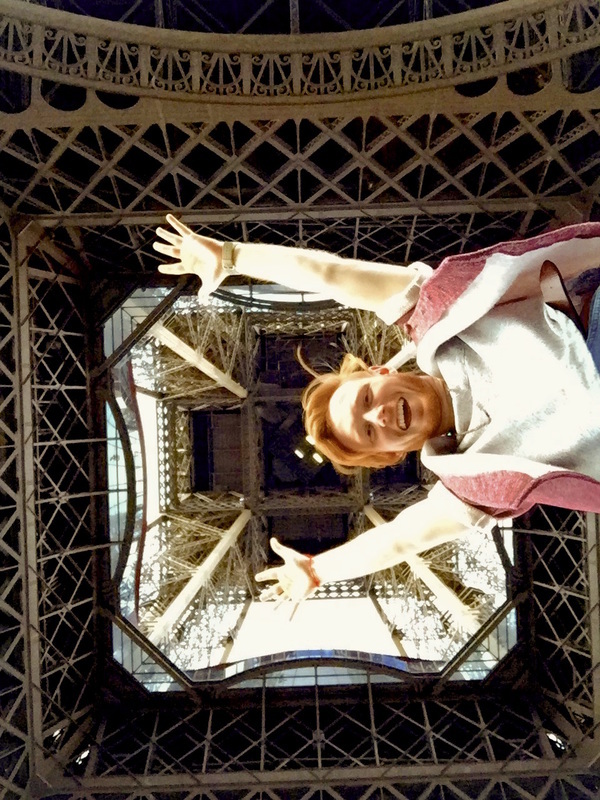 I have really enjoyed my stay in Paris and have learned so much about the artist, and dance culture, but it was nice to go to another country abroad to compare and contrast what I have learned in Paris and what is available in London. In this entry I am going to focus on the theatre culture specifically between the two opera houses, The Palais Garnier and The Royal Opera House. When the group went to The Palais Garnier I was blown away by the beauty and refinement in architecture. It was a museum of opulent material and craftsmanship that we studied and reasoned as we toured the halls. The opposite was the case for The Royal Opera House in London. The architecture of the building was still stunning, but due to the time of construction the style greatly differed from that of The Palais Garnier. The Royal Opera House was more open with glass domes that replicate a train station, and clean line best suited for socialization. There were exhibits and galleries as you walk the halls, but the building is set up as a more modest environment to enjoy an afternoon or night at the theatre. I learned that the Royal Opera House stays open at all times to invite the people of London in to have a cup of coffee on the veranda. It is not just an attraction for tourism; it is also a place of business so that it can serve as a part of the English social culture. All in all both theatres are fantastic works of art, but the environments where greatly different. The experience of exploring the two opera houses was one that I will never forget, they differ so much from American theatres and opera houses with their history, their architecture, and their patrons that have such love for the performing arts. On Thursday this week I was able to visit the Musee d'Orsay. This particular museum houses many works from artistes that have been deemed as impressionist such as Monet, Manet, and Degas, it also showcases works from post-impressionist Vincent Van Gogh. I had the opportunity to do research on Van Gogh as a part of my artist research project earlier in the week and felt connected to Van Gogh’s work when I saw the collection in the d’Orsay. Van Gogh was known for his excellent artwork and also his eccentric personality, and seeing these paintings in person truly expressed his lineage and influences. In this assignment we were asked to observe two painting and compare them in an open discussion, so naturally I chose two paintings by Van Gogh, L’Arlésienne and La méridienne dit aussi La sieste. These two paintings where created at two different times in Van Gogh’s life only a year apart; La Sieste in 1889 and L’Arlésienne in 1888. The two works have similar use of color, still life, and portrait which where qualities that where very popular at the time. There is a key difference in the composition of the paintings where La Sieste was a re-painted adaptation of a sketched work by Millet and L’Arlésienne is an orinial work based off of a friend of Van Gogh named Mme Ginoux. La Sieste was painted during a time when Van Gogh was staying in a mental hospital and had more limited resources but would still mail his painting to his brother Theo. The painting is an excilent use of contracting colors orange and blue and has a vibrant stroke texture that gives it a surreal expression of what Van Gogh experienced when seeing the work by Millet. As for L’Arlésienne it shows similar use of color, but the full perspective is clearly on portrait. The painting is stunning and a well represented image of Mme Ginoux as she was a woman that Van Gogh had grown fond of. Both of these paintings showcase two separate talents Van Gogh had in his career, but also highlight his creativity and use of color and perspective. It was a great experience to see his work so closely. Vincent Van Gogh is one of the most referenced artists in history so to be in a room surrounded by his generous and passion was personal best of this experience in Paris. The first week of my Dance in Paris adventures have past and all I can to show for it are sore legs and the pictures below. I can barley express the amount that I have learned from this city and from the leaders of this program. From the Luxembourg Palace to Monet’s Gardens in Giverny I feel like I have seen it all, but in reality I have barely made a dent. We have taken class at 4 studios since we have been here and each one has been a completely unique experience. From classical ballet, and modern to baroque court dancing, I am learning that a large part of my experiences have to do with understanding the language. I feel confident taking class in a difference language, but it plays a large part on what I am able to catch on to and what I am able to achieve in the class. I am finding that it is easy to follow along with the class but when the instructor’s breaks it down it is hard for me to find the specific action the instructor wants the class to adhere to. I am able to keep up if I tune my eyes and ears, so that I become more observant of the movement being portraying, and also the rest of the class and how they are responding. Two full days in Paris and I have been to the Eiffel Tower twice. Is that an appropriate amount of time to see this magnificent structure? Who knows maybe by the end of my time in Paris I will visit the tower 29 times. Standing underneath this structure is beyond breath taking, and all I can say about it is that the pictures and the history stand no comparison to the actual sight. It is an exposed, raw, wrote iron sculpture dedicated to French history that can easily be the most recognizable, monumental piece of architecture in the world. Seeing the Parisian culture portrayed proudly in this barebones, intricate monument is an experience that all should embark upon. It is named after the engineer Gustave Eiffel, whose company designed and built the tower in 1889 as the entrance to the 1889 World's Fair, it was initially criticized by some of France's leading artists and intellectuals for its design, but later become a global icon of art and engineering. My eyes are forever changed through the image of this tower, and this experience only excites me to see more of the monumental architecture that Paris has to offer. Over the past semester I have been planning my time in Paris in small increments, gradually so that I wouldn’t over whelm myself with the rush of information, and also so I could stay in the constant mindset that I would be over in this city for the month of May. I kept a calm thought process similar to how I was when I spent a summer in New York City. Before I knew it I had somehow convinced myself that this transition to Paris would be simple and understandable, “I have nothing to worry about.” I had addresses to studios, the locations of where I was staying, a cell phone “wifi” plan, and a European power adaptor; I thought all was set up. I soon landed in Paris with my bags in hand and I realized “wow I didn’t land in JFK Airport or LaGuardia,” I had a rush of panic for about two seconds then I walked around the baggage claim area in Charles de Gaulle about 17 times. I wasn’t lost I just needed to walk off the fear and catch up to the facts that I was in Paris. After I felt inside my own head I walked down to the metro section of the airport to get into the city center. It took me a while to figure out the metro, but once I had it I felt unstoppable. In hindsight I wish I could have been less nervous but it kept me alert to stay aware of my stops. When I arrived and placed my bags down in the hostel I was staying in for the night I became overwhelmed with a since of accomplishment because I made it! If I can navigate then I can live in this city. I was off to explore. Once I left the doors of the hip hostel I started walking, down the street, around the corner, up a side road, and I realized where am I going? Once again I felt this overwhelming panic because, yes I can ride the metro, but no I don’t know where anything is. So I walked back up, around, and down to find the metro station closest to me; I snapped a picture of the metro map and leapt into action, FIRST STOP EIFFEL TOWER! I decided it would be the appropriate stop for a first time Paris explorer and I was right because the experience of riding the “6 metro” across the river to the Bir Hakeim metro stop, and I saw the Eiffel Tower. Seeing this monumental structure standing in the near distance was one of the most remarkable moments of my life. It took me by surprise because of how the metro is set up, as it raises from underneath the street and juts out from in-between buildings. That moment of surprise was when I knew that no matter how much I thought about Paris, or read the books, studied studios, and research pictures I would always be surprised by its beauty and culture. I reflected on what Paris could be, but I never expected what it actually was.